In this post I will describe how to prepare solid vpn gateway which works flawlessly with many different clients. I choose the solution based on modern IKEv2 protocol created with Microsoft and Cisco together. In a big simplification – IKEv2 (Internet Key Exchange version 2) is responsible to set up a security association (SA) in the IPsec protocol suite. 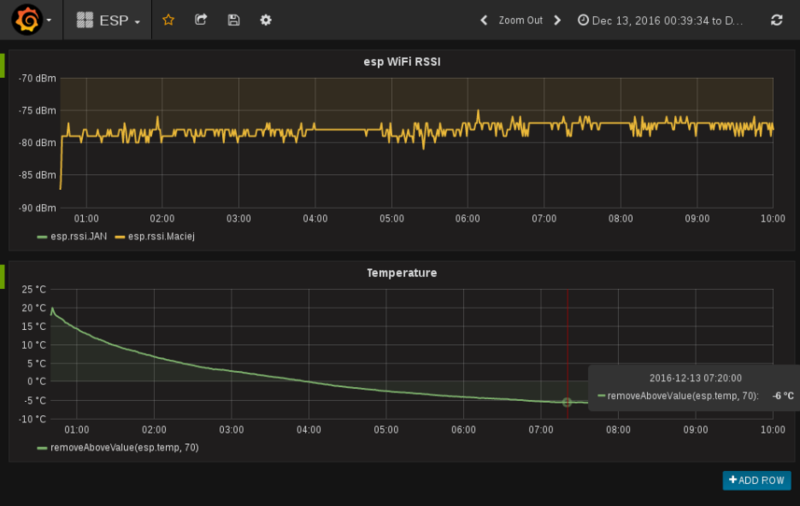 it tolerates interruptions, latency etc. on network connection. 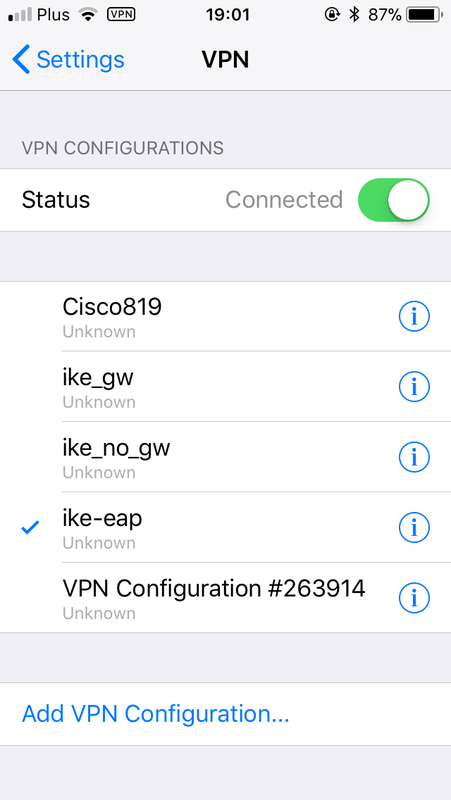 For example, if the connection is temporarily lost, or if a user moves a client computer from one network to another, IKEv2 automatically restores the VPN after the network connection is reestablished — in transparent way to the user. 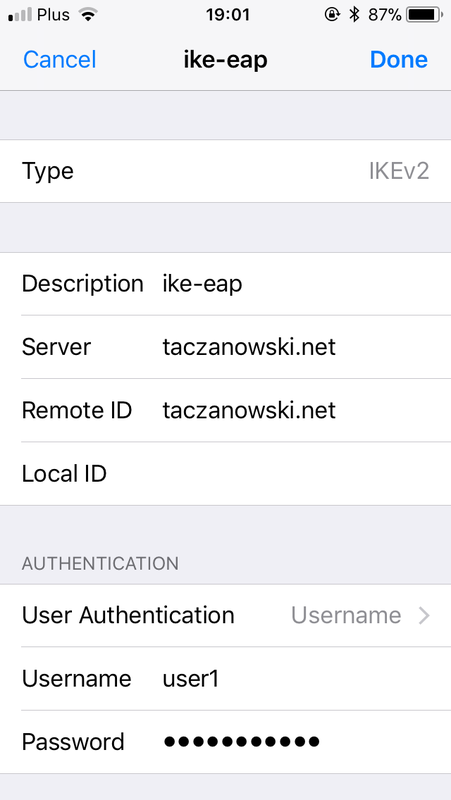 IKEv2 has built in client in Windows 7 and newer and on macOS and iOS systems. For Android there is a StrongSwan client app which is working very well. In Linux we can simply use Strongswan which is one of IPsec implementation for Linux. I will skip the part describing an obtaining a certificate from Let’s Encrypt. It is well documented in internet. For server/gateway side I used Strongswan which provides support for IKEv2. After that we have to add private key (/etc/ipsec.d/private/privkey.pem) and define usernames and passwords for vpn clients. router:~ # cat /etc/ipsec.secrets # # ipsec.secrets # # This file holds the RSA private keys or the PSK preshared secrets for # the IKE/IPsec authentication. See the ipsec.secrets(5) manual page. 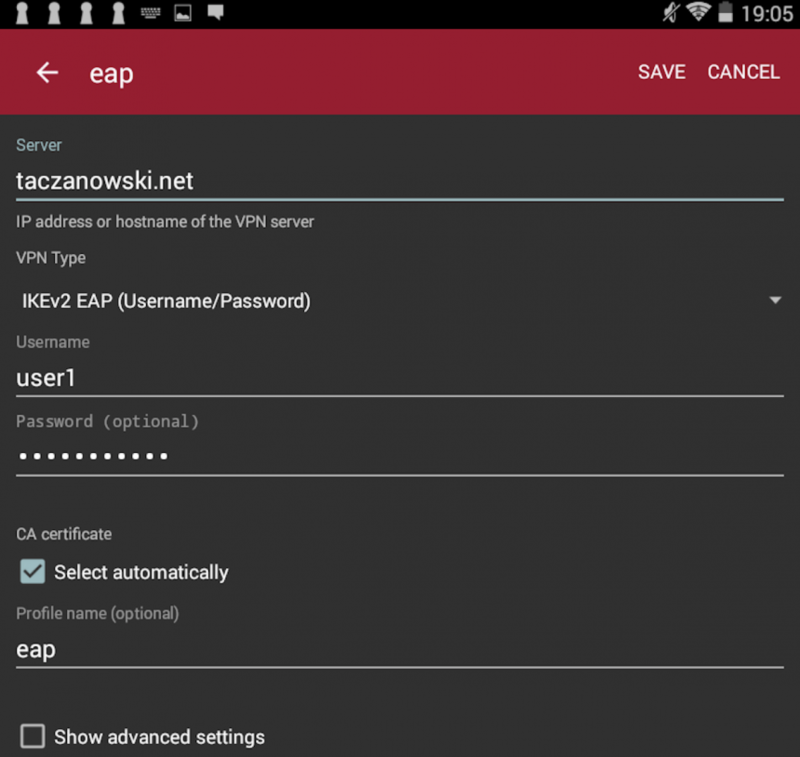 # : RSA privkey.pem user1 : EAP "user1_password" user2 : EAP "user2_password"
If don’t have configured NAT/masquerade your clients will not have internet. In most clients it is trivial. Unfortunately, manual configuration is slightly complicated. But then it works very well. In newer releases of Linux distribution there is a gui plugin for network manager which provide easy configuration of vpn connection. But I haven’t tried it. x201:/etc/ipsec.d/cacerts # cat /etc/ipsec.secrets # # ipsec.secrets # # This file holds the RSA private keys or the PSK preshared secrets for # the IKE/IPsec authentication. See the ipsec.secrets(5) manual page. # user1 : EAP "user1_password"
# File where to add DNS server entries. # priority of this plugin. # Prefix used for interface names sent to resolvconf(8). 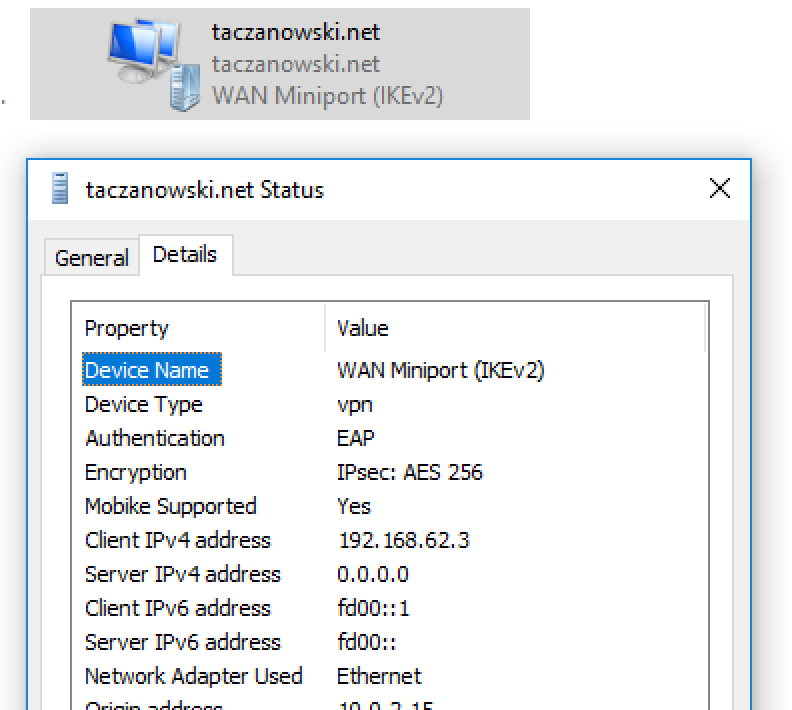 Carsten who reads this post shared with me some observations with configuring IKEv2 connections on Windows clients. 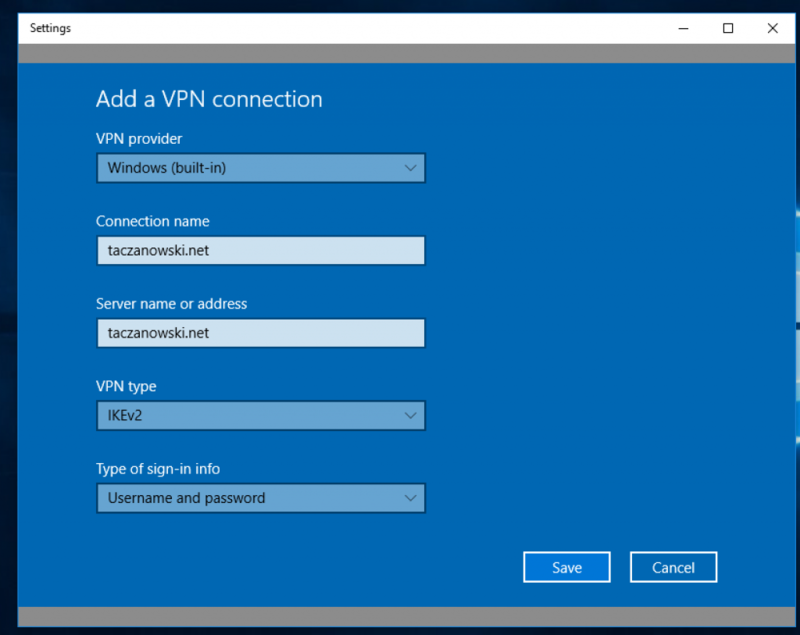 In more sophisticated scenario, than described here when we don’t want to set vpn connection as default gateway for clients (redirect all trafic to vpn tunnel), but we want use vpn connection only for some specified remote networks then Windows client is a problem. Windows has no support for traffic selector provided by strongSwan. The VPN LAN should be different to the remote LAN. Therefore in Windows “Use default gateway on remote network” must be set. Therefore “leftsubnet=0.0.0.0/0” is necessary, because all traffic of the client goes through the VPN (which is not nice). Without “Use default gateway on remote network” Windows only sets a route for the VPN LAN, which is useless. It should be possible to set a route to the remote LAN by using the PowerShell. I haven’t tried that yet. Thanks Carsten for sharing your observations. 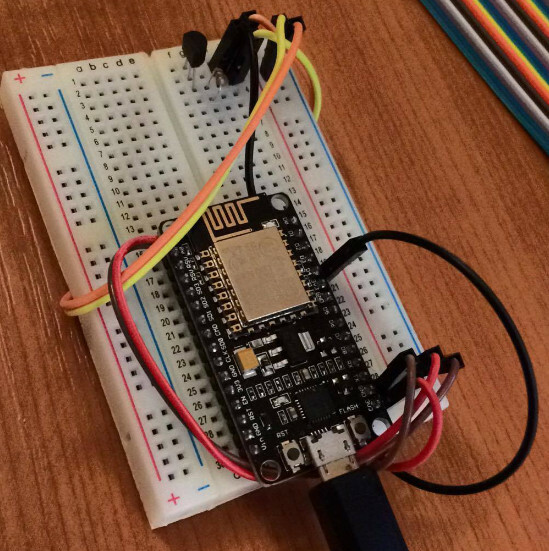 Recently I bought esp8266 (NodeMcu) – it is a low cost device with wifi chip, that can be programmed by Arduino IDE or Lua script language. You can download this through library manager from Arduino IDE.